Finally it came to the day for me to say goodbye to MorinoKi. 12-day time was not very long but I did really enjoy myself here. 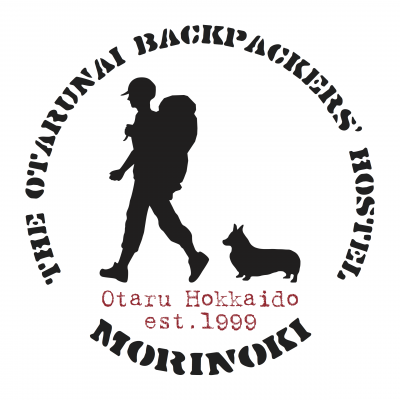 It is a unique guesthouse I have visited so far in Japan, or even in the whole world. 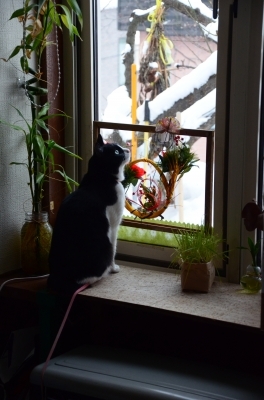 Yesterday and this morning there were heavy snowfall. After my lunch, a lot of snow and ice fell down from the roof. We did an emergency cleanup for that. 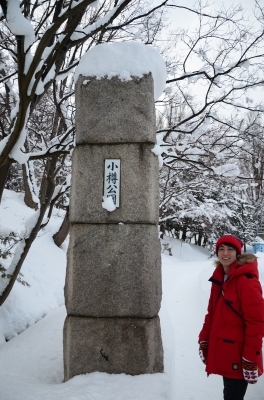 At the time I arrived MorinoKi, the snow level on the ground in front of the entrance was only reaching my knees; now it is higher than my whole body! It is very horrible. 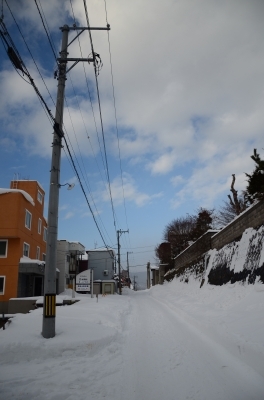 The weather this afternoon was quite good; it has only little snowfall. I went to the Suitengu Shrine (水天宮) to have a look. 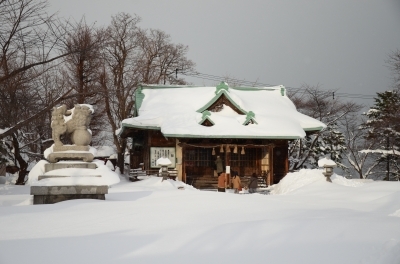 The feeling of going to shrine in winter is different than in other seasons. Snow is covering the ground, the buildings, the statues and so on; it is beautiful. 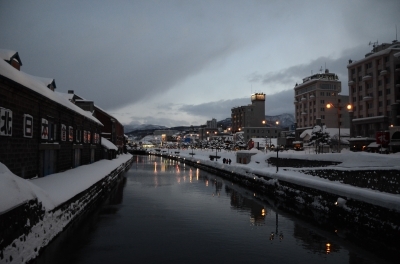 I also went to buy souvenirs and walked around near the Otaru Canal. It was the last night for me to experience Otaru before I leave tomorrow. 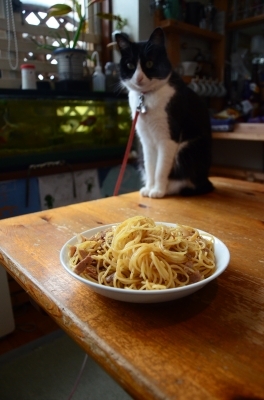 Today Masa-san, Ayano-san and I had lunch together. 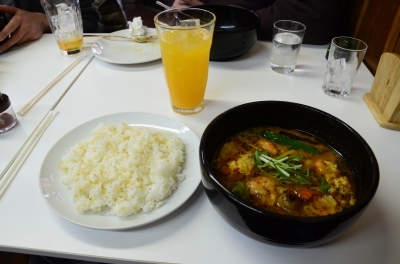 We went to a soup curry restaurant near Minami-Otaru Station. There were many choices. And it was quite delicious. 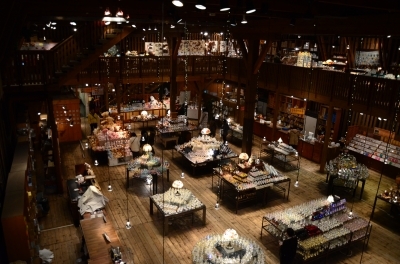 In the afternoon, I went to Sakaimachi to buy some souvenirs of Otaru. I planned to walk around there until dinner time, however the snowfall was becoming heavy. Finally, I was back at MorinoKi earlier than expected. I only bought a music box; perhaps I need to go there later to buy some more souvenirs such as wine and postcards. 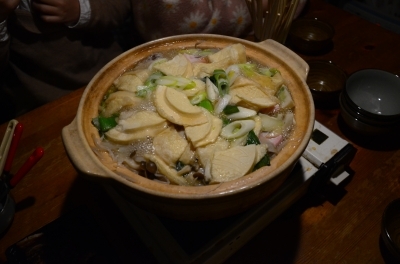 At night, we had a hotpot dinner together. 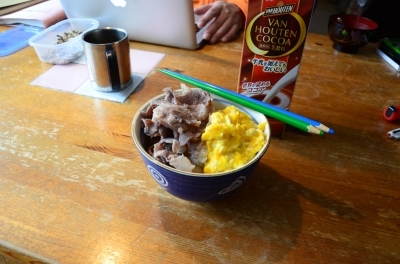 It is good to have hotpot at home, which is difficult to happen if there are too few people joining. Today was the leaving day of LuLu-san (the girl from Taiwan). 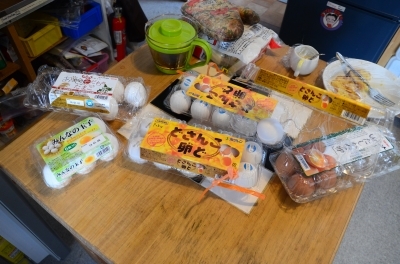 She gave us a lot of gifts, such as eggs, banana, pasta, instant noodles, etc. We had a farewell lunch together in a ramen restaurant. 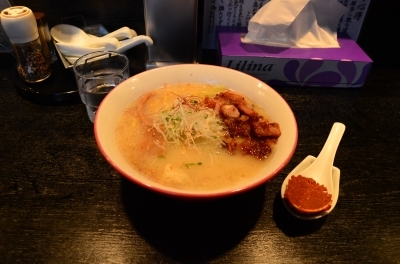 It was quite delicious after mixing the spicy sauce into the ramen soup. My ex-colleague in Hong Kong would come to Otaru tonight to have dinner with me, so I walked around the Otaru town this afternoon. However, the snow was falling most of the time. 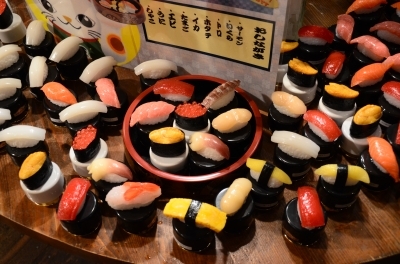 We had a sushi dinner near the Otaru Canal. It was tasty but a bit expensive. 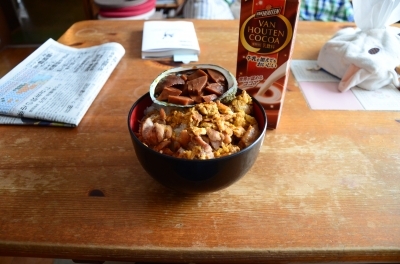 I cooked salt grilled pork and fried egg for my lunch. The pork was a bit too salty. 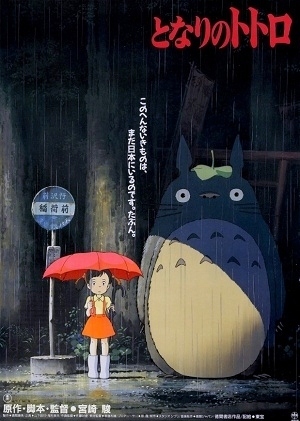 In the afternoon, it was sunny sometimes. 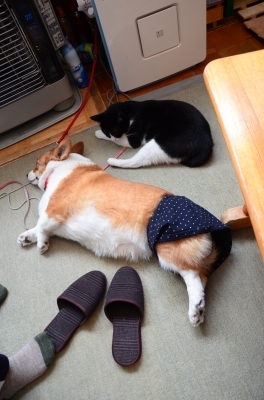 However, I was too tired and fell asleep. 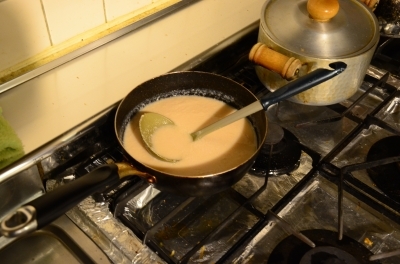 I woke up after a few hours; then I went to the kitchen again to make the sweet half sake (甘酒) using the dregs (酒粕) I bought in Higashi Hiroshima (東広島) before. I also read the cookery book and try to make ginger grilled pork (豚肉のしょうが焼き) for my dinner. It seemed that I put too much soy sauce so it was quite salty. 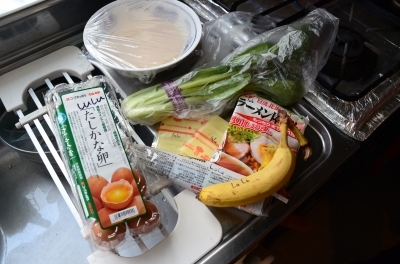 Anyway, I learnt that new course; I can try to cook again after back to Hong Kong! Happy New Year (あけましておめでとうございます)! After the countdown event yesterday, I slept at 4am. And then, I got up at 6:30am to see my friend Paku-san off as he needed to take an early flight to Seoul. I was really tired because of the lack of sleep. 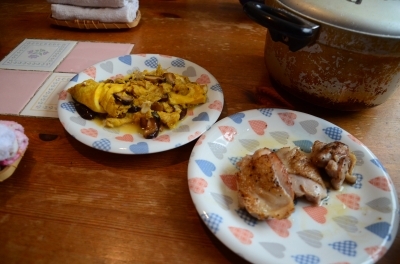 This morning Masa-san prepared some new year food for all of us. 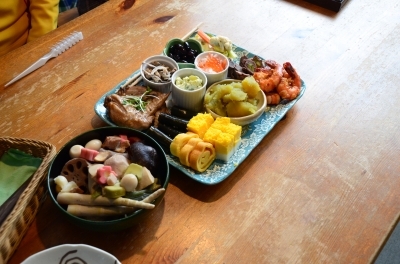 It was the first time to see Japanese new year food. 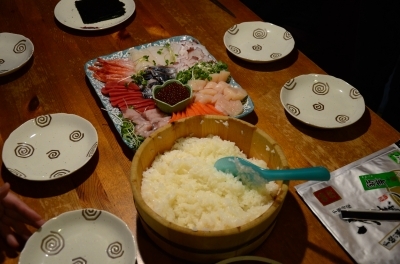 My dinner tonight was self-made seafood bowl rice (海鮮丼). 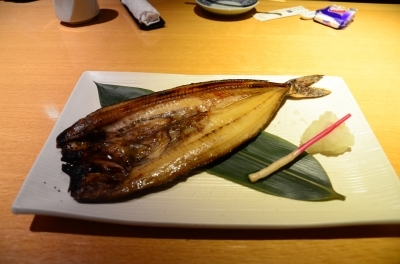 In the past I usually ordered this in restaurants outside; it was the first time to make by myself. It was interesting! 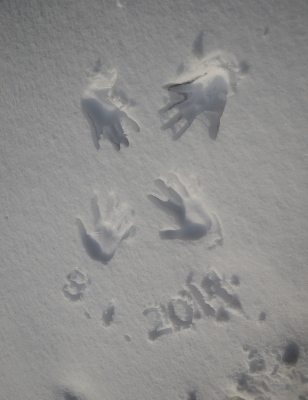 Today is New Year Eve (大晦日). Everyone was waiting for Year 2014 to come. Today's weather was quite good. It was not very cold and also sometimes sunny. 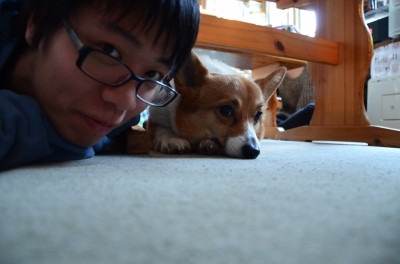 Paku-san and I walked to the Otaru Park (小樽公園). 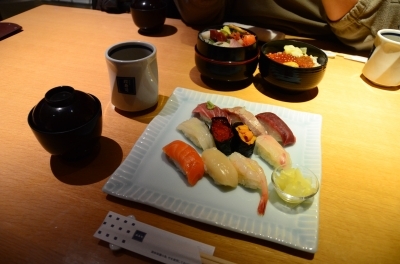 At night, we all had sashimi, sushi and Japanese New Year cuisine in MorinoKi. 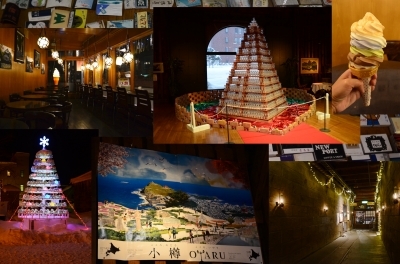 After dinner, we went to the Otaru Beer (小樽ビール) to join the countdown party and celebrate the New Year. 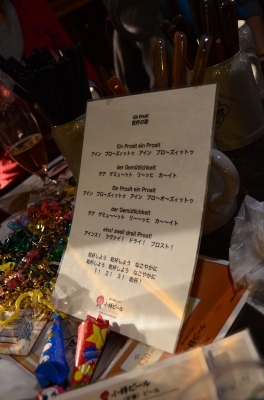 We tried different beer and sang "Song of toast" (乾杯の歌) there. It was the first time I stay outside Hong Kong during New Year. I had a great time tonight! 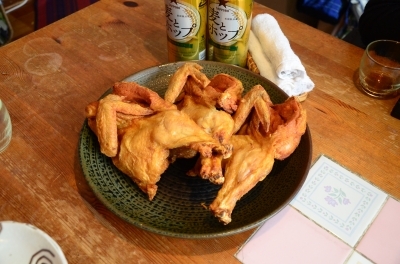 We also ate fried chicken wing and breast ordered outside. They were more delicious than the chicken meat I cooked. We all had a good time tonight. This morning the roadway was completely covered by thick snow; yesterday night should be having heavy snow. 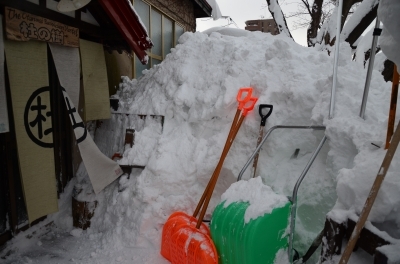 People from the houses nearby also came out to remove snow. We were all working hard to maintain our living environment. Today I took some funny pictures with Hug-san. He is very cute! 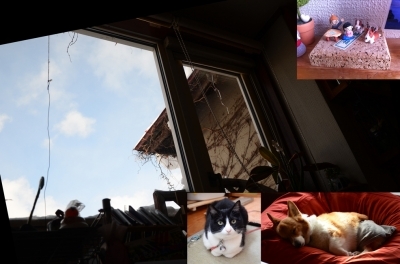 I didn't go out today under the poor weather (or I was too lazy?). 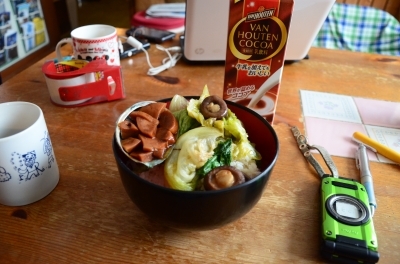 I made my first lunch in Hokkaido. I cooked a common Hong Kong styled dish but it was a simplified version - stir fried lettuce (レタス) and shiitake (椎茸) in oyster sauce. 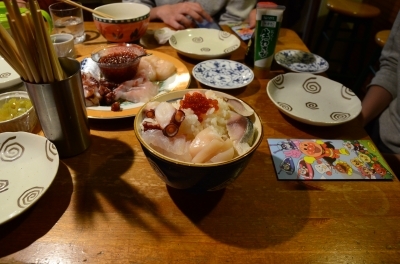 I also ate an abalone boiled in Japanese pepper (あわび山椒煮) which I have never tried before. 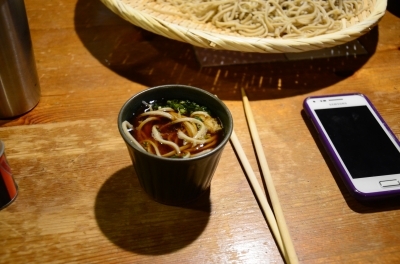 At night we had a soba noodles (そば) dinner together. 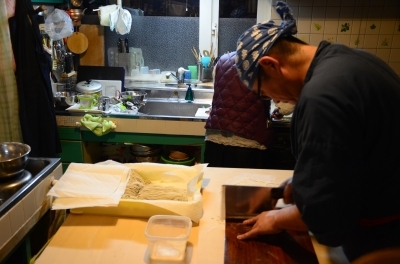 It was the first time for me to see the making of soba noodles.